This is for Connie Schultz. She recently wrote about hearing a customer in a bookstore ask about books for children whose parents get deployed. The customer was turned away with none to be found. This is also for that bookstore, that customer and anyone else who might be looking for similar books. My telephone just rang with a recorded message for a local Veterans Day celebration. Then I got an e-mail from the Iraq and Afghanistan Veterans of America asking about my plans this week and offering a list of events across the country. So … what are you doing this week? But it apparently didn’t tell FBI agents before sending them to Baghdad to investigate the Sept. 16, 2007, incident that left 17 Iraqis dead. The investigative misstep comes in the wake of already-strained relations between the United States and Iraq, which is demanding the right to launch its own prosecution of the Blackwater bodyguards. Misstep? The U.S. State Department can’t seem to get a grasp on oversight. The U.S. embassy offers to pay Iraqi families $12,500 for each Blackwater victim. Who’s running this joint? FEMA? Blackwater spokeswoman Anne Tyrrell declined comment about the U.S. investigation. It’s not clear why the Diplomatic Security investigators agreed to give immunity to the bodyguards, or who authorized doing so. Bureau of Diplomatic Security chief Richard Griffin last week announced his resignation, effective Thursday. Senior State Department officials, speaking on condition of anonymity, have said his departure was directly related to his oversight of Blackwater contractors. But Blackwater branches out and expands its contracts, even though it was accused of stealing Iraqi airplanes, smuggling and illegally selling weapons, almost killing a U.S. soldier and evading taxes. Last week, Secretary of State Condoleezza Rice ordered a series of measures to boost government oversight of the private guards who protect American diplomats in Iraq. They include increased monitoring and explicit rules on when and how they can use deadly force. Right. Cultural awareness training. Yeah. That’ll fix it. Heckuva job, Condi. At least the immunity explains why Blackwater CEO Erik Prince “welcomes extra oversight,” has employed a new PR campaign and blitzed (blizted with Blizter … get it?) the media, chatting with everyone but Letterman, and asked reporters to contact Congress on Blackwater’s behalf. Sort of his own little “bring ’em on” statement. ***Oh, wait. Blackwater always had immunity. Oh, that Bush. He’s such a kidder. Iraqi Prime Minister Nouri al-Maliki is pissed. Blackwater USA employees killed one Iraqi police officer and 10 Iraqi civilians and wounded at least 13 Iraqi bystanders in a shootout in Baghdad on Sunday, Sept. 16, 2007. Maliki called the action criminal, threatened to prosecute those involved, canceled Blackwater’s operating license and ordered the company out of the country on Monday. On Tuesday, the United States suspended all land travel by U.S. diplomats and other civilian officials in Iraq outside the Green Zone in Baghdad. Scratch that. Convoys guarded by Blackwater resumed today after suspending them for only four days. The U.S. embassy struck back at the prime minister, releasing a report that details corruption in his government. I’m curious. Who were the U.S. diplomats being guarded by Blackwater employees, and will they be required to testify before the committee? Was it Rep. Dave Reichert, R-Wash., and his delegation — Reps. Barbara Cubin, R-Wyo., Brad Ellsworth, D-Ind., and fourth-timer Steve Pearce, R-N.M. — who recently returned from an “intense two-day tour” of Iraq? No. They were there the weekend before last. Was it third-time visitor Olympia Snowe, R-Maine, and her delegation — Sens. Max Baucus, D-Mont., fourth-timer Ben Nelson, D-Neb., and third-timer Ken Salazar, D-Colo.? Maybe. They were on the heels of the other delegation and were in Iraq on Saturday and Sunday. Blackwater spokeswoman Anne E. Tyrrell said Blackwater’s contractors acted lawfully and that the “civilians” who were killed were armed enemies. An Iraqi report said Blackwater guards were not ambushed. Instead, they fired at a car when it did not heed a police officer’s call to stop, killing a couple and their infant. In video shot after the episode, the child appeared to have burned to the mother’s body after the car caught fire. In the meantime, Blackwater remains in Iraq, and Rice is telling everyone she has ordered a “full and complete review” of security practices, including Blackwater, which has a $1 billion, five-year contract with the U.S. State Department. Update at 4:45 p.m. ET:We’ve requested comment from Blackwater USA. In the meantime, campaign finance records show that Prince has been a big donor to the Republican Party. In July, he gave $20,000 to the National Republican Congressional Committee. Nice try, but that’s just the beginning. $1,000 on Nov. 2, 2004, to Sen. Tom Coburn, R-Okla., who visited Iraq in September 2006. $1,000 on Sept. 26, 2005, and $1,000 on Nov. 16, 2004, to Rep. Thomas DeLay, R-Texas, who visited Iraq in August 2003. $1,000 on Oct. 29, 2004, to Sen. Jim DeMint, R-S.C., who visited Iraq in February 2005. $500 on Sept. 21, 1999, $1,000 on Aug. 24, 2004, and $1,000 on March 31, 2005, to Rep. Peter Hoekstra, R-Minn., who visited Iraq in August 2003, September 2003, June 2004 and November 2004. $1,000 on Oct. 29, 2004, to Rep. Duncan Hunter, R-Calif., who visited Iraq at least six times. $2,100 on Aug. 23, 2006, to Sen. John Kyl, R-Ariz., who visited Iraq in November 2004 and February 2007. $1,000 on Nov. 2, 2004, to Rep. Jerry Lewis, R-Calif., who visited Iraq in September 2003. $1,000 on Jan. 4, 2006, and $2,000 on Dec. 19, 2005, to Rep. Mike Pence, R-Ind., who visited Iraq in February 2004, September 2005 and April 2007 (his fifth visit). $750 on Oct. 29, 2004, to Rep. Ted Poe, R-Texas, who visited Iraq in February 2005. $1,000 on Oct. 31, 2005, and $500 on Sept. 26, 2005, to Rep. Jim Saxton, R-N.J., who visited Iraq in October 2003 and July 2005. $1,000 on March 31, 2005, to Rep. Todd Tiahrt, R-Kan., who visited Iraq in September 2003. That’s just for starters. I’ll keep looking. The USA TODAY guy might want to do the same. When we vacationed in North Carolina last month, I drove into town and spent an afternoon shopping for souvenirs and chatting. Well, I did more chatting than shopping, but that was the fun part. I stopped in a shop on Main Street. Its shelves were filled with ceramics, wooden sculptures, glass work and various local artwork. A boy of about 15 greeted me from behind the counter. I told him I was looking for souvenirs made by local artists. He walked around with me. I held something up, turned it this way and that, and he told tell me who made it and where they lived. I swear he said, “Yes, ma’am,” at least 152 times. We talked about the weather. They were having a heat wave that week. He apologized for the heat. He got me a map and gave me directions to one of the roadside shops that sell gemstones. While we walked around the shop, an older boy passed by without saying a word. As he did, he stepped on the other boy’s foot or shoved him. “Is that your brother?” I asked. Then some colorful glass balls caught my eye. I held one up to the light. “This is nice,” I said. “It reminds me of a witch’s ball,” I said and told him someone once gave me one that was made in Blowing Rock, N.C., and how pretty it was. He lowered his voice and leaned closer to me. Ah, I get it. It’s a friendship ball. 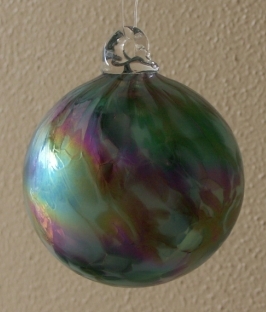 The story goes that a witch’s ball (aka, witch ball) attracts ghosts with its bright colors. The ghost gets sucked into the hole and gets stuck inside. This? Not a witch’s ball. The Associated Press fact-checked President George W. Bush’s speech on the war in Iraq last night. I have no words. Paul Rieckhoff covers it well. Rep. Christopher Shays, R-Conn., started the parade of delegations to Iraq by requesting a visit in early 2003. The Pentagon and the State Department refused. He took off for Iraq anyway in April by joining a convoy of relief workers into Iraq. This will not be my last time going to Iraq. — Rep. Christopher Shays, R-Conn. He was correct. He has been to Iraq 18 times … so far. Less than a month later, a delegation left for Baghdad on May 23, 2003. Until then, Baghdad had been off limits because it was unsafe, even with armed military escorts. Elected officials insisted on going, however, saying they could not exercise “congressional oversight” from Washington. Three more delegations visited from June to August. Even though 23 people died in a car bombing of the Baghdad United Nations headquarters on Aug. 19, 2003, an 11-member delegation visited the city on Aug. 25. By the end of 2003, about a third of the U.S. Congress had visited Iraq. The Pentagon promoted congressional visits, and House GOP leaders asked every Republican member to visit Iraq as soon as possible. Secretary of Defense Donald Rumsfeld believed visits would increase congressional support. I was hopeful that progress was being made, but based on the media coverage I had seen, I wasn’t certain. After three days of touring the country, I am now certain that we are making progress. — Rep. Joe Wilson, R-S.C., after his Sept. 13-15, 2003, visit to Iraq (York Daily Record, Sept. 24, 2003). U.S. House members were part of a delegation in Iraq, Oct. 6-10, 2003. Amory Houghton Jr., R-N.Y., said he was not concerned about his safety. Right on their heels was an all-female delegation during the week of Oct. 20, 2003. Rep. Deborah Pryce, R-Ohio, wondered if there was a more positive story in Iraq than often portrayed in media accounts that emphasize continuing violence and Iraqi and U.S. fatalities. Rep. Dave Weldon, R-Fla., visited Nov. 6, 2003, even after a military transport helicopter went down, killing at least 16 troops (FLORIDA TODAY, Nov. 3, 2003). Rep. Bob Beauprez, R-Colo., expected to leave for Iraq in mid-November 2003 even though a trip by another congressional delegation had to be cut short after a bomb blast ripped through United Nations headquarters (Rocky Mountain News, Nov. 15, 2003). A suicide bomb killed about 50 people and injured scores of others near Baghdad on Feb. 10, 2004, but Gov. Kathleen Blanco, D-La., “presented a positive picture of the occupied country” during her delegation’s visit Feb. 10-11, 2004. Even though extensive security measures highlighted danger at every turn, Blanco said she never felt at risk: “We were well-protected.” Guard units in front and behind their vehicles escorted the delegation, and Apache helicopters flew overhead. In April 2004, Rumsfeld, who extended the tours of some 20,000 troops, expressed surprise that the death toll was higher than he expected. April was the deadliest month of the war so far with 147 U.S. troops and hundreds of Iraqis killed. Sen. Robert Bennett, R-Utah returned with renewed confidence in the importance of the war and that troop morale was high after his visit June 3-6, 2004. Two U.S. troops died on July 14, 2004, when a suicide bomb killed 11 and wounded 40 near the British embassy, insurgents beheaded a hostage and assassinated the governor of Mosul and the director general of Iraq’s Industry Ministry, capping off an explosion of violence in July, as almost 36 U.S. troops died in the first two weeks. At least seven more delegations visited in August and September, during which time a mortar hit the roof of the U.S. embassy, and two mortar shells exploded about 500 yards from a delegation waiting to board a helicopter, and one U.S. soldier died in Baghdad that day. Continued violence kept a September delegation from seeing much of Iraq up close, as they spent most of their time in helicopters and Humvees with tight security and flak jackets. Another delegation visited while officials sought freedom for several hostages. Two car bombs wounded American and Iraqi troops west of Baghdad on Sept. 26. Egyptian and British leaders urged the release of abducted workers and a civil engineer kidnapped with two Americans, later beheaded. Insurgents had kidnapped more than 140 foreigners and killed at least 26 of them. A rocket slammed into a busy Baghdad neighborhood, killing at least one and wounding eight. Hours later, another loud blast shook the U.S. embassy, where the delegation was. A car bomb exploded in front of the Green Zone in October 2004, and another delegation arrived days later. Several more delegations visited from then until the end of the year. In January 2005, insurgents bombed the U.S. embassy, killing two Americans, while a delegation was in Baghdad for the elections. Yet another delegation visited in mid-January 2005. Under the table Winston’s feet made convulsive movements. … He was back at the Ministry of Love, with everything forgiven, his soul white as snow. He was in the public dock, confessing everything, implicating everybody. He was walking down the white-tiled corridor, with the feeling of walking in sunlight, and an armed guard at his back. The long-hoped-for bullet was entering his brain. … But it was all right, everything was all right, the struggle was finished. He had won the victory over himself. This just in — The surge is working. Here is the Washington Post article the editorial mentioned, “Lawmakers Describe ‘Being Slimed in the Green Zone. '” It said three members of Congress (Rep. Jim Moran, D-Va., Rep. Jon Porter, R-Nev., and Rep. Ellen Tauscher, D-Calif.) who recently visited Iraq were annoyed about “biography sheets” everyone had about each of them. These sheets included everything from how to pronounce their names to how they voted on the war to quotes they made publicly about the war. Nobody is sure who distributed the sheets. They were stunned when Iraq’s national security adviser watched children’s cartoons while he met with them. I bet the cartoon (unlike the meeting) wasn’t a rerun. Sen. Lindsey Graham, R-S.C., wore fatigues and carried a pistol for his tour of duty in Iraq. He was there for two weeks. I wonder if he saw anything like this while he was there. For two weeks.